Wizardry manufactures a shared-dc-bus power supply. to power some types of textile-winding-machine panels, because the act of stopping the huge main-motor inertia on those machines regenerates 15-20,000 watts for as long as 20 seconds. The standard industry practice is to dump that energy into a braking-resistor, which wastes energy & increases the burden on the building air-conditioning system. Instead, with a shared-DC-bus, the energy from a stopping machine powers the other machines on that shared-DC-bus. This shared-DC-bus power-supply is rated at 124,000 watt continous DC output. 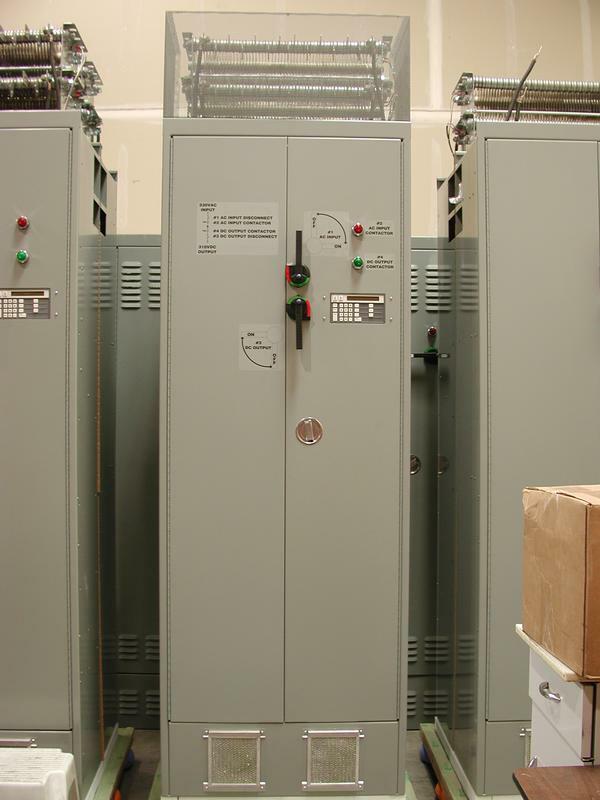 The caged brake-resistor (top of the unit) can absorb up to 100,000 watts for short periods of time. Automatic capacitor-precharge & contactor control. Over- & under-voltage, over-temperature, & over-current (etc.) trips. Variable fan speed control depending on load & internal temperature. Digital display of operating conditions via a built-in 1-line terminal. Digital display of operating conditions via a multidrop CRT-terminal display. User-adjustable parameters (e.g. undervoltage-trip-point, etc.). Communication over a legacy LAN (Local Area Network), to provide a peak-load-limiting (peak-shaving) service. Approximately 2 shared-DC-bus power-supplies are installed (wired in parallel), for every 20 textile-winding-machine panels, which allows the system to operate normally even when one power-supply is offline (e.g. for a maintenance event like fan-replacement).